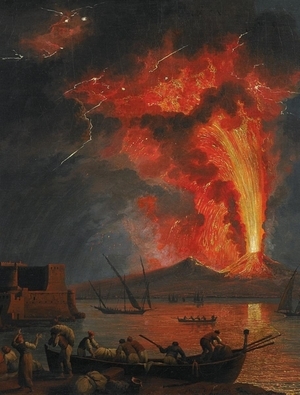 Italy's Mount Vesuvius, an active volcano, has a storied history; the painting above illustrates its eruption in the year 79 C.E., a catastrophic event that obliterated the Roman cities of Pompeii and Herculaneum. The painting is by Jacob Philipp Hackert and dates to 1845; in 2009, it sold at auction for a rather steep 138,000 Euros. Now, in checkers, there is the famous (or maybe not so famous) Vesuvius Shot, which "buries" 14 pieces from both White (Pompeii, if you wish) and Black (Herculaneum). But there's something else that's buried here. Checker enthusiast Manon Pruitt, of Nashville, North Carolina, used the Kingsrow ML computer engine to help dig it out, and we extended the analysis to find something deeper still. 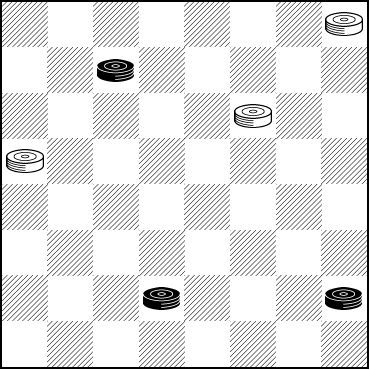 The starting position comes from play in Wood's Checker Studies. Black to Move and Win? At this point Mr. Pruitt found, using KingsRow, that 25-21 instead of 25-22 would draw, thus overturning the problem conditions. 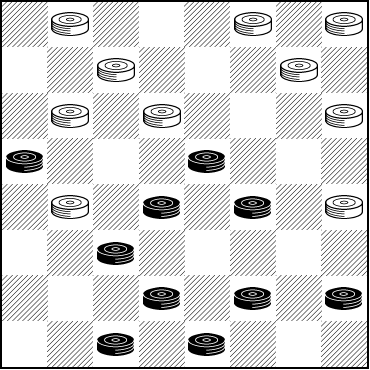 But we investigated further and determined that in fact the published move, 25-22, also draws! There is a flaw in the ensuing published play. Here's position after 25-22. Black would now win if the above play were correct, but it's not. Your challenge is to correct it. Don't explode or erupt. Stay calm, and you'll find the solution, after which you can let your mouse vent on Read More to see the answers. On move 8 White's 22-18 is incorrect and loses. 29-25 is correct. Variations are possible after the initial 29-25. The difference between 29-25 and losing moves such as 22-18 is subtle and hard to spot in over the board play, so we'll have to extend forgiveness to the original publishers. And even if flawed, Vesuvius is explosive and spectacular. Just how well known is the Vesuvius Shot? We asked around and found that very few checkerists, even senior problemists, were familiar with it. We're not sure why, and perhaps had it been better known its flaws would have been exposed sooner. Our thanks to Manon Pruitt for bringing this one to our attention.